This machine was developed to cut slit drains in milled peat fields to accelerate drainage in the poorer quality areas. The drains cut to a definite pattern comprising three longitudinal slits, one central and one on either side, with cross drains giving exit to the ditches at regular intervals. The machine comprises a standard agricultural tractor on full tracks with a chain saw cutting attachment similar to the chain saw machine. The tractor has a special transmission to give the correct forward travel speeds in second, and third gear. The modification involved the replacement of the gearbox primary gear train and the differential crown wheel and pinion, in addition to the insertion of a special reduction gearbox. The tracks comprise flat metal cleats carried on two chains and run on the standard tractor tyre wheels with an additional jockey wheel. The attachment is carried at the rear of the tractor, pivoted on the centre of a standard power-take-off bevel box output shaft and is raised and lowered about this pivot by a hydraulic ram operated from the driving position. The cutting element is a standard transmission chain with cutting teeth secured to it by welding, running over top driving sprocket and a bottom driven sprocket whose shaft carries a cutting impeller on either side outside the support bearings. These impellers, in conjunction with the cutting chain, excavate a tunnel of rectangular section at the bottom of the slit drain cut by the chain only. The machine has a cab with toughened glass windows, allowing good vision for manoeuvring and observing the behaviour of the attachment. 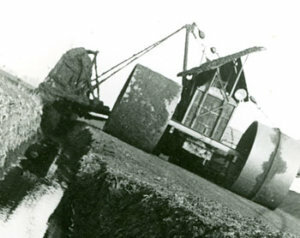 A machine designed and developed for operation on bogs, being prepared for, or operating on, moss peat production. The machine is supplied with a variety of attachments to suit specific duties and for Bord na Móna’s application it is fitted with the slit drainer, the drain cleaner and the levelling screw. The tractor is of light construction with the chassis fabricated from folded steel sections supported on two tracks each comprising two chains carrying steel swamp shoes, running on end sprockets and frictionless bearing mounted intermediate support rollers. The power unit is an air-cooled diesel engine by a reputable manufacturer and the transmission consists of an over-centre single plate clutch, vee belt drive, specially designed four speed gearbox and chain drives to tracks and power take¬ off for attachments. Additional sprockets are supplied to give a variety of forward speeds to suit specific attachments. Steering is effected by coil clutch and brake bands. The machine is fitted with a hydraulic system to control the level of the various attachments. All controls are centralised in a totally enclosed cab adequately glazed. The slit drainage attachment is used to open initial drains in new bog. It comprises a cutting boom of small buckets carried on special chains and sprockets. The content of the buckets is discharged mechanically into a vane type spinner which throws the spoil clear of the drain. The drain cleaner/digger attachment is the same as the slit drainer but cuts a wider drain and is used to deepen and maintain drains after the first sod cut is made. The screw leveller attachment is used for the preparation of fields on moss peat bogs to remove the vegetation and level the surface to facilitate the performance of cutting machines and the stability of the sod walls formed by these machines. The attachment has the facility to camber surfaces.